A “Rotten Tomatoes” for Comics? Confession: I don’t see a movie before checking out its rating on Rotten Tomatoes. While the creator side of me has an inherent dislike of boiling down creative work to an artificial score as a judgement of worth…the consumer in me doesn’t want to waste my money on a well-marketed piece of crap. Movies are too damn expensive. And while there is no one critic whose word I take as gospel, I find a consensus of reviews to be a pretty good indicator of whether or not a flick is worth my time and pesos. 1.) As a comics and media fan who loves aggregating information to get the skinny on things. 2.) As the co-owner of a creator-centric and comic focused website…I know you guys would LOVE to know about this site. 3.) As a publisher and creator of comics and graphic novels, who recognizes the importance of reviews for getting the word out about our titles. I see several of our titles, like SCAM, THE RED TEN, and THE STANDARD have already made it on the site. Obviously, I’d want to know more about how it works to make sure our books are represented fairly there. For these reasons, I reached out to Ken Marden, creator of Kubla Comics to get the details on this intriguing new site. Tyler James: Why KublaComics? What made you decide to build this site? Ken Marden: Kubla Comics grew out of my own frustration in missing good comics. There’s so many comics being published these days and they’re not 60 cents anymore, like they were when I was a kid. So, figuring out how to spread that $10 or $20 a week is getting harder and harder. I was up late one night (changing my newborn daughter’s diaper) and thinking to myself: “what service is missing for comic book fans” and it hit me. Like comics, going out to the movies has gotten more and more expensive, so making sure that our hard-earned dollars is going to quality entertainment is really important. Why not create a Rotten Tomatoes for comic books? Aggregating reviews, grabbing all of the opinions out there and putting them in one place, seems like a great way of making it easier for fans to discover high-quality comics that they might not have heard of otherwise. And in the process, hopefully they’ll discover artists, writers, publishers, and even reviewers and comic book review sites that they didn’t know about before. TJ: How does a review for a comic get on your site? KM: We’ve automated the process as much as possible, but it still comes down to a human being going out, grabbing the review, and putting it into our database. TJ: The rating system is a big feature. Without revealing too much of your secret sauce, how do you boil reviews down to a single number, when most reviewers use their own rating systems, or don’t score the comic at all? KM: I chose a 5-point system quite simply because many review sites use a 5-point system. The risk of “translation” is that our own subjective opinion alters the original intent of the reviewer. Translating “3 out of 5 stars” into “3 out of 5”, therefore, is making the process as objective as possible. Obviously, it gets more complicated with other systems — percentage, letter grades, etc — and, as you say, it’s a little bit of our secret sauce, but it’s still somewhat intuitive. We’ve gone through each site really carefully to make sure their rankings line up with our 5-point system as much as possible. For what we call text-only reviews, again, it’s fairly straightforward. I’ve made sure that each rank on the 5-point scale is very clearly articulated and defined. A rank of one means the reviewer hated the comic and used words like “awful” and “terrible”. Two means the reviewer disliked the comic and used words like “poor” or “bad”. Three means the reviewer gave the comic a mixed review, some positive, some negative, and used words like “mediocre” or “okay”. Four means the reviewer liked the comic and used words like “good” or “great”. Finally, a rank of five means the reviewer loved the comic and used words like “amazing” or “masterpiece”. Once a “native” rating has been translated into a Kubla rating, then we simply average out the numbers. There is no weighting! As much as some reviewers are more polished, more articulate, or just down-right better writers, it’s not up for us to decide if they’re “more important” reviewers. One thing I would like to say is that as much as we highlight our Kubla Rating, it’s not all about the numbers. The movie critic Lisa Schwarzbaum, in her final column in Entertainment Weekly, said: “Grades, stars, thumbs, and assorted icons are inevitably crude, if handy, quantifiers of quality — they’re shorthand, attention-getting invitations to the party. Once we’ve shown up, though, let’s have a good time pondering both the complexities of Django Unchained and the simplicities of A Good Day to Die Hard.” Replace Django and Die Hard with whichever comic or graphic novel is generating buzz that week and the point is the same: I stand firmly behind our numbers, but with something as inherently subjective as a review, it’s important to understand that they’re not the end of the conversation, they’re the beginning. TJ: If I’m a comic reviewer and I’d like my reviews to show up on your site…what do I do? KM: If a review or reviewer isn’t represented on our site, then we simply need someone to let us know. Email us at “contactus@kublacomics.com” or through the “Contact Us” form which will be up on the site sometime soon. TJ: Like anything, all reviews are not equal. I’m not impartial, but ComixTribe’s own John Lee’s does some of the best reviews for creator-owned comics out there. While other reviews are nothing more than poorly written plot synopses. Is KublaComics in the review quality control business? KM: There is a vetting process. A review has to be someone’s thoughtful, articulated opinion, ideally with some context behind the reviewer’s history with the character, creators, etc. and with some attempt to break down the writing and art. As you point out, if something is just a plot synopses, poorly written or otherwise, we don’t include it. It’s too bad, too, because there are a handful of people out there calling themselves reviewers who don’t seem to understand that and yet are clearly committed to writing something every week. Being a reviewer means being something other than a fanboy or girl. It means trying to understand the intent of the creators and then informing the consumer about whether that intent was achieved. And, yes, I totally agree with you: John Lees is a great reviewer, someone who clearly gets the role and who takes the time to articulate his opinion to the benefit of the comic book fan audience. TJ: Where are you in development? Any new features in development that we can look out for? KM: I’m very excited about the blog and webcomic section of our site — we’re calling it Kubla Blah — which we’ll be launching in time for the Boston Comic Con at the end of April. Further down the road, we have plans to add user reviews as well as a customizable interface which will allow users to follow their favorite creators, publishers, reviewers, etc. and get recommendations based on their preferences. There are other ideas in the works, so people will have to stay tuned to see it all unfold. Besides the site, comic fans can stay connected with us (and join the conversation) on our Facebook page and on Twitter. I really want Kubla Comics to be the place all comic book and graphic novel fans turn to to explore, discover, and stay abreast of the comics we all love. So there you have it. Check out kublacomics.com. 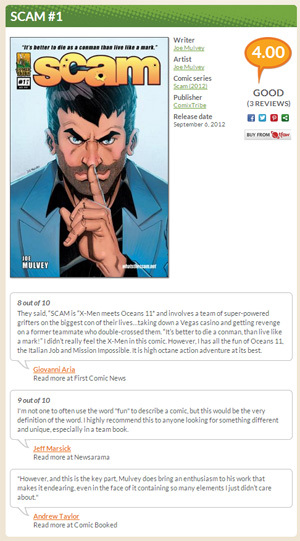 Personally, I love the idea of a comics reviews aggregator…if movies and books and music can have one, why not comics? Of course, it only works if people use it, so I’d encourage all of you reviewers out there to send Ken an email and get your opinions counted.